Glenn Herbert Gould (25 September 1932 – 4 October 1982) was a Canadian pianist, noted especially for his recordings of the music of Johann Sebastian Bach. He gave up concert performances in 1964, dedicating himself to the recording studio for the rest of his career, and performances for television and radio. The trouble begins when we start to be so impressed by the strategies of our systematized thought that we forget that it does relate to an obverse, that it is hewn from negation, that it is but very small security against the void of negation which surrounds it. And when that happens, when we forget these things, all sorts of mechanical failures begin to disrupt the functions of the human personality. My private motto has always been that behind every silver lining there is a cloud. I wasn't motivated to do it [re-record Bach's Goldberg Variations] until rather recently, when it occurred to me, on one of my rare relistenings to that early recording, that it was very nice, but that it was perhaps a little bit like thirty very interesting but somewhat independent-minded pieces, going their own way, and all making a comment on the ground bass on which they are all formed and to which they all conform. And I suddenly felt, not having played it in, well, since I stopped playing concerts, about 20 years, having not played it in all that time, that maybe I wasn't savaged by any over-exposure to it, and that if I looked at it again, I could find a way of making some sort of almost arithmetical correspondence between the theme and the subsequent variations, so that there would be some sort of temporal relationship, I don't want to say just exactly 2, 4, 8, 16, 32, that kind of correspondence, but, you know what I mean, there would be a sense in which, substituting for the fact that Bach had absolutely no melodic design that is continuous but rather a base harmonic design that is continuous, there would be at least a rhythmic design that is continuous, and the sense of pulse that went through it. And that seemed to me sufficient justification [...] to do it all over again. transcribed from The Glenn Gould Collection vol 13 (Sony laserdisc). I tend to follow a very nocturnal sort of existence mainly because I don't much care for sunlight. Bright colors of any kind depress me, in fact. And my moods are more or less inversely related to the clarity of the sky, on any given day. A matter of fact, my private motto has always been that behind every silver lining there is a cloud. Don't be frightened, Mr.Gould is here. (audience laughter) He will appear in a moment. I am not — as you know — in the habit of speaking on any concert except the Thursday night previews, but a curious situation has arisen, which merits, I think, a word or two. You are about to hear a rather, shall we say, unorthodox performance of the Brahms D Minor Concerto, a performance distinctly different from any I've ever heard, or even dreamt of for that matter, in its remarkably broad tempi and its frequent departures from Brahms' dynamic indications. I cannot say I am in total agreement with Mr. Gould's conception. And this raises the interesting question: "What am I doing conducting it?" (mild laughter from the audience) I'm conducting it because Mr. Gould is so valid and serious an artist, that I must take seriously anything he conceives in good faith, and his conception is interesting enough so that I feel you should hear it, too. But the age-old question still remains: "In a concerto, who is the boss (audience laughter) — the soloist or the conductor?" (Audience laughter grows louder) The answer is, of course, sometimes one and sometimes the other depending on the people involved. But almost always, the two manage to get together, by persuasion or charm or even threats (audience laughs) to achieve a unified performance. I have only once before in my life had to submit to a soloist's wholly new and incompatible concept, and that was the last time I accompanied Mr. Gould. (audience laughs loudly) But this time, the discrepancies between our views are so great that I feel I must make this small disclaimer. Then why, to repeat the question, am I conducting it? Why do I not make a minor scandal — get a substitute soloist, or let an assistant conduct? Because I am fascinated, glad to have the chance for a new look at this much-played work; because, what's more, there are moments in Mr. Gould's performance that emerge with astonishing freshness and conviction. Thirdly, because we can all learn something from this extraordinary artist who is a thinking performer; and finally because there is in music what Dimitri Mitropoulos used to call "the sportive element" (mild audience laughter) — that factor of curiousity, adventure, experiment, and I can assure you that it has been an adventure this week (audience laughter) collaborating with Mr. Gould on this Brahms concerto; and it's in this spirit of adventure that we now present it to you. Glenn brought an extraordinary awareness and imagination – he had a very plastic mind - and he was capable of growing, of changing too. Bach offers a very rich field for differentiation of approaches because he was so unspecific about what he did, in terms of performance. But every time one plays a piece, it’s an opportunity not so much to go where the composer didn’t, but to come closer to what one conceives of as being the experience of the composer or the intention of the composer. Glenn Gould, 'the greatest intepreter of Bach'. 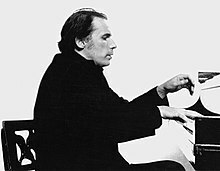 Glenn Gould has found his own approach to Bach and, from this point of view, he deserves his reputation. It seems to me that his principal merit lies on the level of sonority, a sonority that is exactly what suits Bach best. But, in my own view, Bach's music demands more depth and austerity, whereas with Gould everything is just a little too brilliant and superficial. Above all, however, he doesn't play all the repeat, and that's something for which I really can't forgive him. It suggests that he doesn't actually love Bach sufficiently. It is as a Bach player that he will live and his recordings constitute his permanent legacy. Sometimes, as in the Partitas, he forced professionals, music lovers and critics to reconsider the music, throwing overboard all preconceived notions. It was not only that he had wonderful fingers and an ability to clarify the linear elements of the music. Other pianists — admittedly, not many — could do that too. But none had his particular kind of firmly centered sonority; a sonority that Piero Rattalino, the Italian specialist on pianists, compares to the sound evoked by the great colorists — Horowitz, Richter and Michelangeli. Above all, Gould's Bach interpretations made the music sound different — different in tempo, in phrase, in dynamics, in conception. Elements nobody previously had paid much attention to suddenly sprang into high relief. But there was noting eccentric or mannered about the performances. The music was passing through a mind that took nothing for granted. It was an original mind that worked on a different set of premises and principles from other pianists. One could not describe it as traditional Bach playing, or romantic Bach playing, or neoclassic Bach playing, or modern Bach playing, or musicological Bach playing. Whatever it was, it breathed a life and spirit unique in the history of Bach performance. Bruno Monsaingeon: What a strange instrument you have! Glenn Gould: I think that it has a quite good sound! Gould: That thing! (seeming to be irritated, imitating a German accent) Mister, don’t be so disdainful about a member of the family! Monsaingeon: What do you mean by "member of the family"? Gould: It is a travel companion, without whom I cannot work, without whom I cannot play. I have been using it for 21 years, this... thing! That we could also classify as chair! Monsaingeon: Did you really perform concerts with it? Gould: I’ve never given any concert without it; at least for 21 years. Monsaingeon: Do you mean... that it has been as close to you as Bach? Gould: Oh, very much closer for telling the truth. This page was last edited on 24 January 2019, at 22:37.